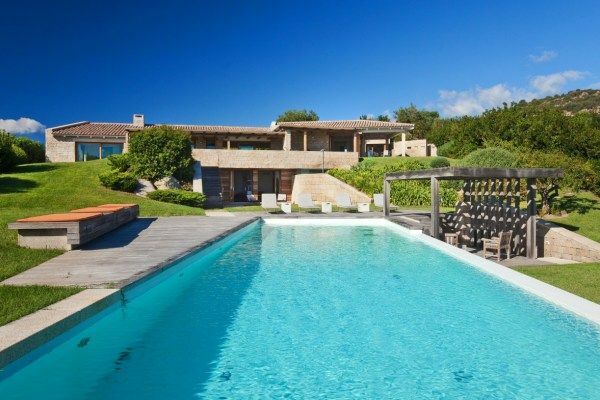 Two of the most beautiful beaches in Europe are within sight from a modern luxury villa overlooking the beautiful bay of San Teodoro, on the North East coast of Sardinia, not far from the Costa Smeralda. 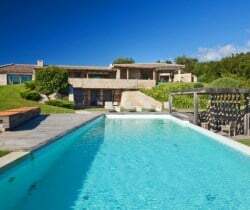 The property enjoys an enviable position and commands sensational unobstructed panoramic views of hills rolling and dipping towards the turquoise Sardinian Sea beyond. 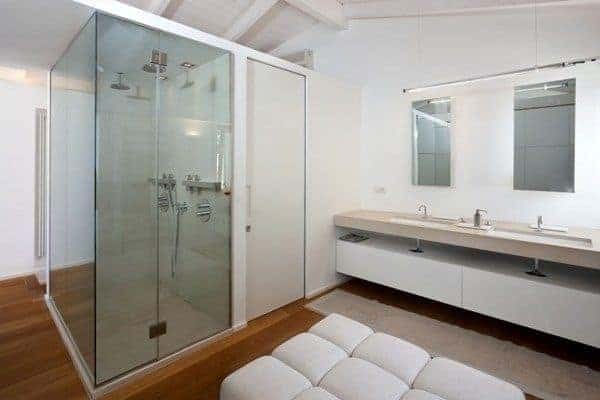 This luxury villa is in a quiet spot on a bluff, one kilometer from the coast and nearby the sparkling sands and crystalline waters of Lu Impostu and Cala Brandinchi. 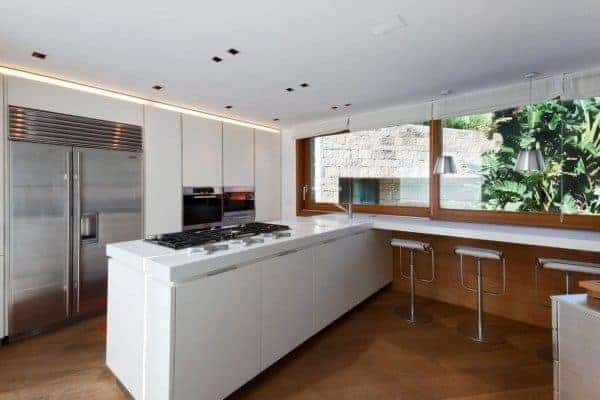 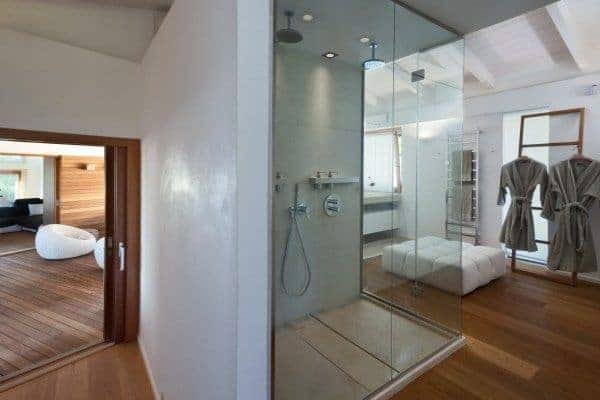 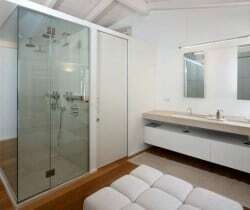 It is part of an exclusive, private and quiet modern development (completed in 2003) from which guests can easily visit Porto Cervo to spend an evening enjoying the nightlife and the crowds on the Costa Smeralda, that is less than 1 hour away by car. 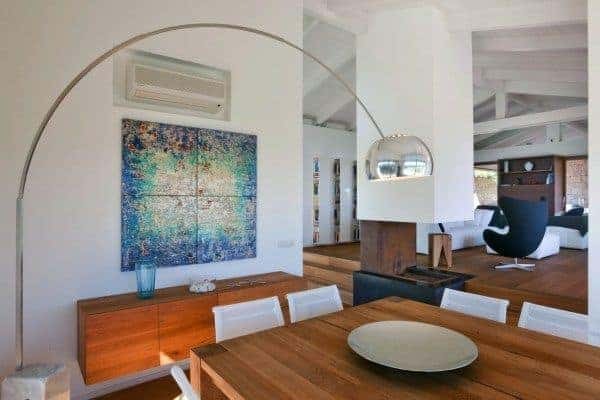 Unlike most Costa Smeralda properties, this is a very high quality, modern villa that is creation of famous Italian architects who took inspiration from the traditional Sardinian stone home, ‘stazzo gallurese’. 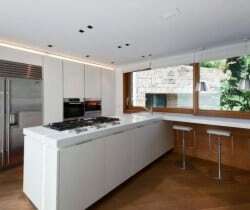 From that they have fashioned a luxurious residence that is also impressive by its airiness and openness. 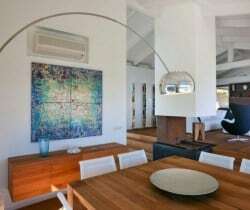 The ambience is relaxed and mellow, the décor of primarily beige and white tones, white vaulted ceilings with cross beams and a variety of dark wood flooring (parquet, floorboards) to offset bespoke contemporary furniture in a combination of wood, fabric and white wicker. 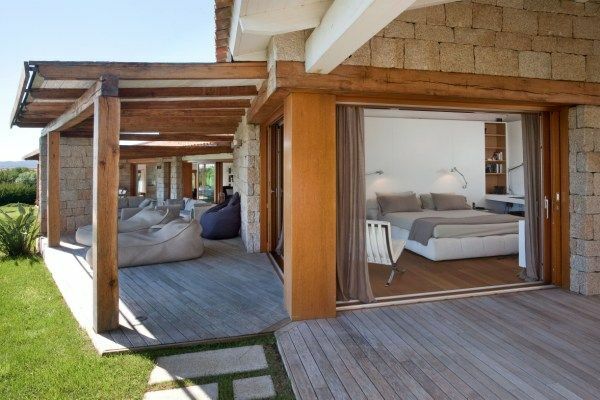 Glazed sliding walls back the wide wood-decked and pergola-covered terraces. 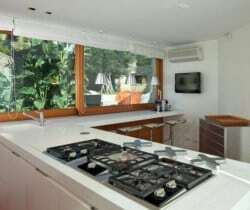 These ‘pockets of joy’ are thoughtfully positioned for embracing the serene climate and scenery and a long swimming pool in the garden is a more recent addition and is accompanied by a wide sunbathing deck and separate massage area. 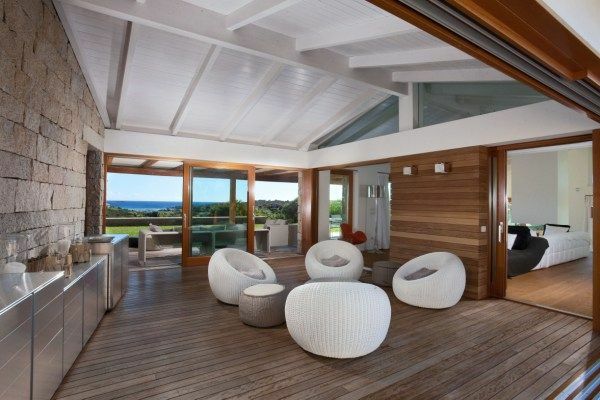 Distributed on 3 levels and with many lounge areas, both indoor and outdoor, you will be able to relax throughout the day at this luxury villa. 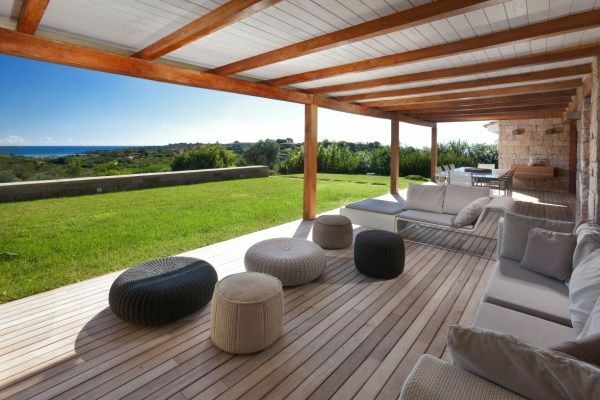 The architecture and design of this property means that there is always somewhere that is both protected by wind and that is blessed with great views. 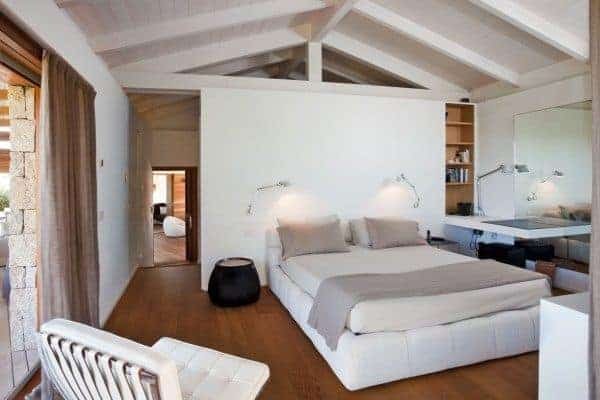 There is also plenty of room for all residents – the villa sleeps up to 8 guests in 4 spacious, modern bedrooms, to enjoy one another’s company as well as privacy, when desired. 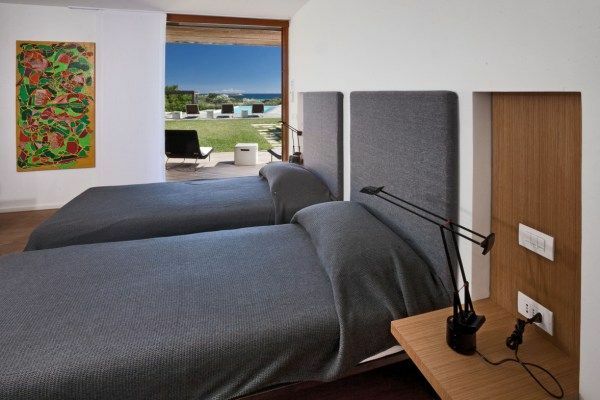 In addition, there are spacious staff quarters that, if needed, can be used for the occasional visiting guest or for the younger members of the group, bringing total capacity to 10-12, thanks to a small double bedroom en suite with a Flou sofa bed. 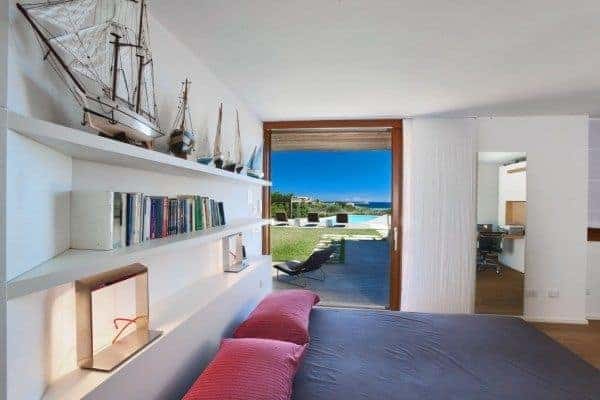 It is not easy to find such a complete property in Sardinia, particularly one that is so close to the sea and with such a high quality of design, furnishings and generous spaces carefully organized by passionate owners. 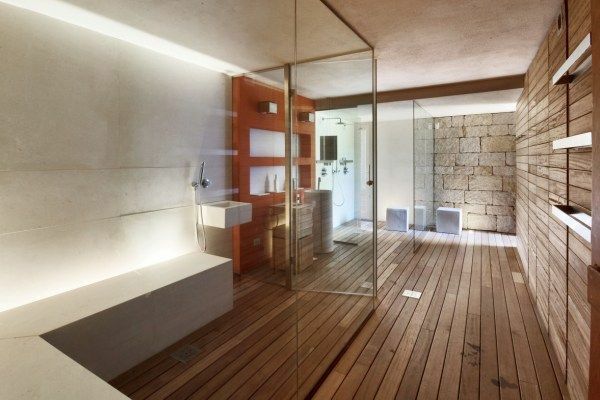 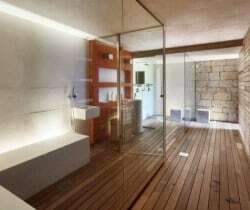 In addition to the long outdoor swimming pool the owners added close to it (but indoor on the lowest level) a hammam: a unique feature in itself for Sardinia, but one that is perfect for guests wishing to soak up some more and differently relaxing heat after the beach. 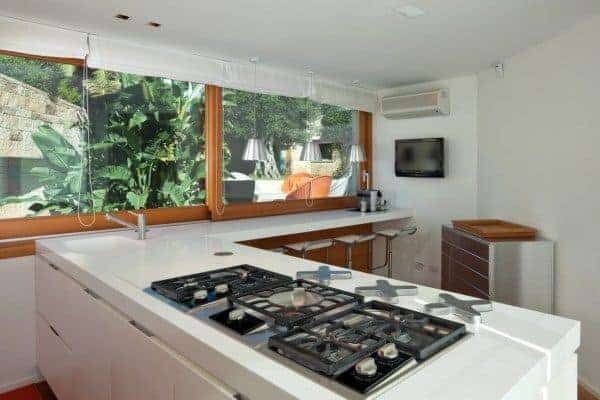 Modern, air-conditioned luxury villas come no more impressive than this stunning Mediterranean designer property, which is at harmony with its surroundings. 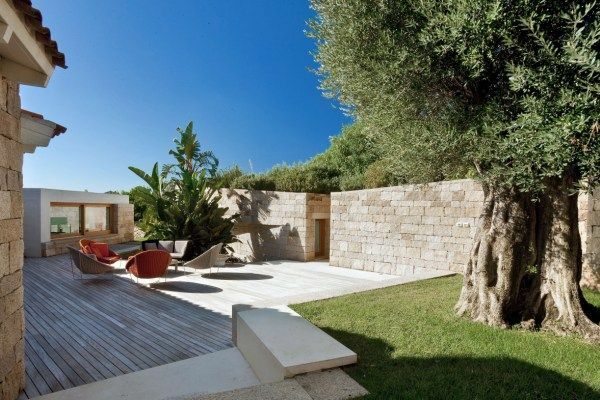 You will not find a better home to recharge and enjoy the colors and beauties of Sardinia. 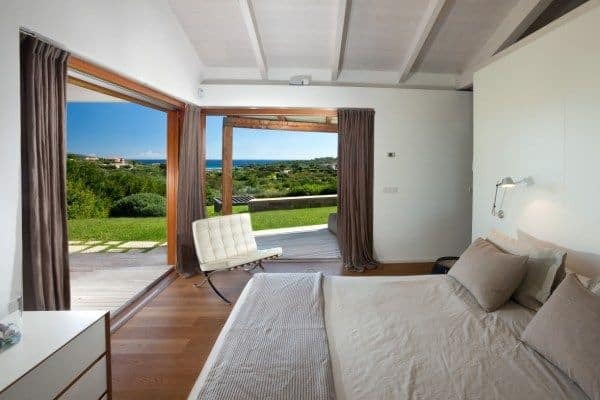 Moreover, you will not find a better value proposition, compared to the properties to be found in the nearby Costa Smeralda.